Spring is a wonderful time of year! Flowers are blooming, birds are singing, and it’s time to pick some delicious, red, ripe, locally grown strawberries. As a child, and even now, nothing tastes better to me than a bowl of cut up strawberries, sprinkled with a small amount of sugar; throw in some heavy cream and BAM! There is nothing that can top that. Peaches and cream take a close second, but I’ll take the strawberries first. In years past, a lot of folks had a berry patch in the backyard, or somewhere on the home place. They were grown using what we refer to as the matted row system. In the matted row system you select a good early, mid, and late season variety so you can extend your harvest season. One would acquire and plant the plants in spring or early fall. It would take about two years to have enough plants and plant growth to begin picking good size berries in numbers. After about three or four years the plants get so thick that berry size begins to decrease. At this time the grower would destroy half the planting, prep the soil and let the daughter plants from the remaining crop ease back into the reconditioned bed. In two years, the process would be repeated on the remaining older bed. It would be destroyed and reconditioned (limed and fertilized) to take on the new daughter plants. This process of renewal kept the berry patch healthy and productive. Some of those matted row varieties have a great taste. This system is still in use today and is a good way to produce berries in the backyard or garden. However, I don’t see many folks growing their own berries anymore. Today, most of our strawberries are grown using the “annual hill” method. Soil is prepped (limed and fertilized accordingly) in late August/early September, then bedded and covered with black plastic mulch. There is a drip tube on top of the bed just under the plastic, usually buried about an inch deep. This will provide a means of irrigating and fertilizing the berries during the growing season. Plants are acquired and planted around Oct. 1. Plants are set double row on the plastic. It takes about 14,000 to 16,000 plants to cover one acre, depending on the plant spacing within the row. Every producer will tweak their equipment to give the desired in-row spacing. The plants are then covered during winter with a lightly spun cotton fabric called row-cover to protect against hard freeze events. Row covers are also utilized in March and early April to protect the young berries and blossoms from frost. On average, producers in our area usually begin picking in earnest, around April 15. I have seen harvest begin as early as April 1 and as late as April 24. It all depends on the weather. Imagine that; a producer’s crop being dependent on the weather! 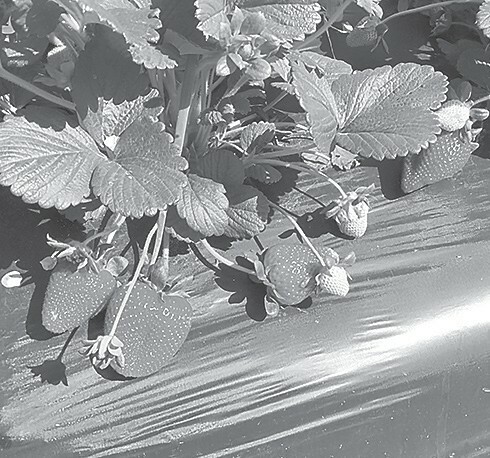 Speaking of weather, an extended period of rainfall during picking season is a huge threat to any strawberry crop. Wet or damp weather makes it difficult to control disease pathogens such as botrytis, which can rot a berry in a hurry. Other weather threats include hail and extreme hard freeze events when temperatures drop below 15 degrees F. Low temperatures have the potential to actually damage the crown and reduce yield. Strawberries also have certain diseases and insect issues that producers have to be aware of. These would include a fungal pathogen known as anthracnose and insects known as strawberry clippers. Two-spotted spider mites can also cause major issues if they get going in the berry patch. Like all fruit and vegetable crops, they have production problems, but at the end of the day, it’s a great crop to grow and even a better one to eat. It is possible that I have unintentionally left someone off this list and if so I apologize in advance. As you can see there are producers scattered across the county. It is time to pick one, make a visit, and get those strawberry pies ready. If anyone happens to cut some up and sprinkle a little sugar on them, let them sit for about an hour or two and give me a call. I will bring my own cream.